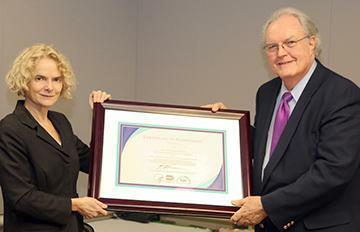 Lloyd Johnston was honored in December by Dr. Nora Volkow, director of the National Institute on Drug Abuse, for his years of contributions to public health. Dr. Johnston designed and implemented the annual Monitoring the Future survey in 1975, beginning with 16,000 high school seniors from 130 public and private schools. Today the survey questions over 45,000 8th, 10th and 12th grade students from nearly 400 schools around the country.